“Being a teaching assistant at university, especially in the field of computer programming, is challenging, yet rewarding. 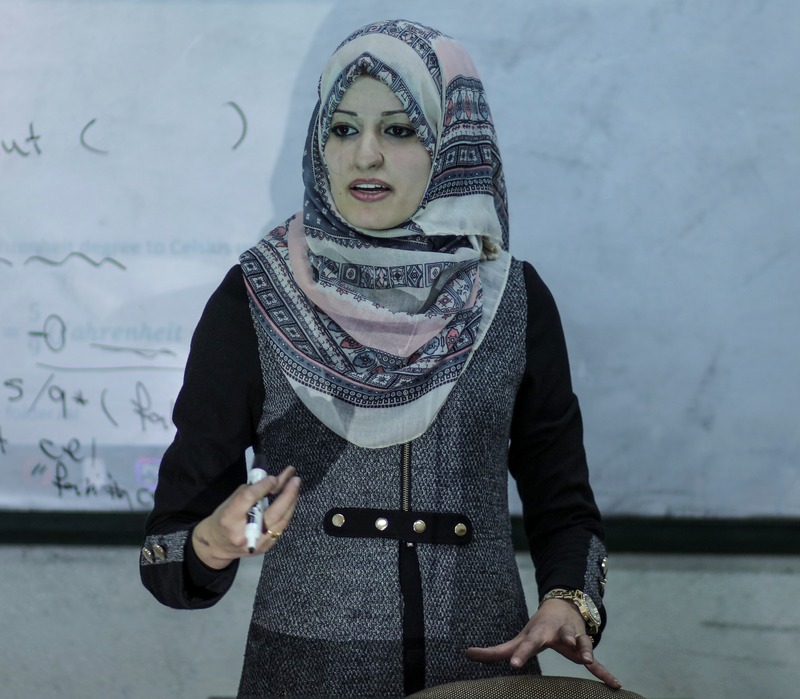 Looking back a few years before, I would not have imagined being where I am today” says Mai Alyazji, a 24-year-old ambitious young lady from Gaza who works at the e-Learning center at the Islamic University. However, Mai was not always confident in her abilities. “My mother, may her soul rest in peace, was the one who advised me to study programming engineering. She said this field would open doors for me, and so convinced me of pursuing a degree in the field. She passed away when I was still a sophomore, and never got to see me graduate” says Mai. Her late mother’s wish pushed Mai further, and she worked harder and harder until she graduated with high marks. While searching for job opportunities, Mai heard about the Virtual Jobs training, which Palestine Education for Employment (PEFE) was implementing, and supported by the Islamic Relief – USA. The training provided young graduates with the skills they need to enter the job market. “I felt that the Virtual Jobs training was exactly what I needed to move forward, so I applied” says Mai. The training was comprised of Workplace Success; a module that aims to enhance graduates’ employability skills and a technical training that helps graduates find employment online. “The training gave me a better perspective on job-interview techniques, and how to make a good impression at the interview” she said. The training also helped Mai develop her interpersonal skills. “This training was my first practical job-readiness experience where I had the opportunity to be acquainted with many people from different backgrounds. This opportunity enhanced my confidence and pushed me to speak my mind clearly with no hesitation. The Virtual Jobs training played an enormous part in developing my communication skills,” she says. Mai is very grateful for PEFE, for the special attention they give to the student. She expresses: “I advise fresh graduates to reach out to PEFE, and hope that PEFE continues its efforts to support youth in the journey of finding sustainable jobs”. Now that she fulfilled her mother’s dream, Mai aspires to pursue a Master’s degree and start her own programming business in the near future.